How do you feel when your organization emphasizes improvement of communication skills yet uses demonstration charts with incorrect spellings? Embarrassing! 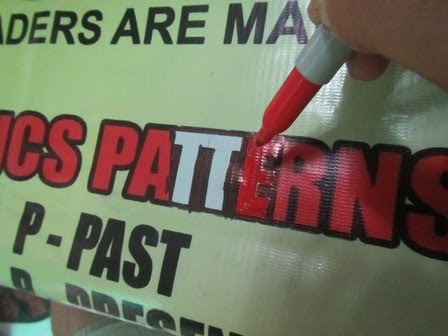 This article will show how I corrected misspellings on a tarp. Imagine my big surprise when I saw the tarpaulin chart that was given away as rewards to Toastmasters clubs that achieved Select Distinguished status for 2016-2017. 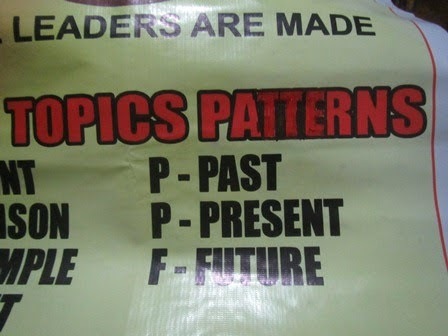 The photo below shows how the Table Topics Patterns chart looked like as it was given. 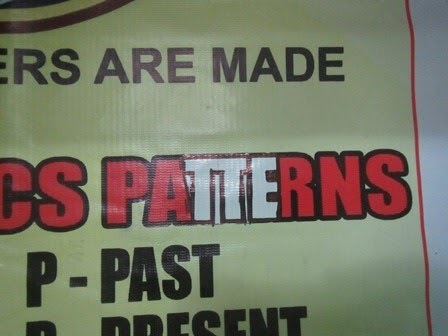 What should have been "PATTERNS" was mistakenly printed as "PATERNS". No, I don't know how this error came about. 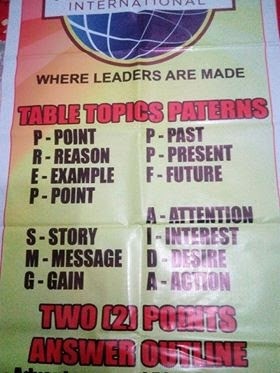 In Facebook, I've seen photos of other clubs using the same tarp chart for illustrating the Table Topics speech patterns. They simply stuck a piece of paper over the incorrectly spelled "PATERNS". It didn't look good, of course. At our club, as a Table Topics Master (Topicsmaster), I've used this same chart for my illustration to guests in the audience and somehow would always apologize for the incorrectly spelled word. Whenever other club members become Topicsmaster, I cringe every time I see the incorrectly spelled word. Enough of this apologizing and cringing, I thought. I took the chart home and made a permanent solution. The colors on the tarpaulin chart are bold and permanent and there was no way of simply writing the correct letters over them. A feasible solution was to put a sheet over the wrong letters and then write over that sheet. Notice that I only cut a piece with a size and shape that would cover the wrong letters and, partially, the left and right letters, "A" and "R". This additional space will allow me to fit in another "T" letter for the correct spelling. I then pencil in the correct letters (with the additional "T") so the size and shape of the letters blend in with the font size and style. You'll see the letters "TTE" lightly penciled in the photo above. Matching the outline color of the letters is easy. I only used a black permanent marker and tried to approximate the thickness of the font outline. You might need to use a straight edge to do this correctly. As best as you can, copy the style of the text's lettering on the tarp. This part is a little tough because I didn't have the exact font color that was used on the tarp. The only color I could think of is red and that's the only red-colored permanent marker I have. It did appear to be a bit brighter than the red color used on the tarp. I made a mistake of putting on the red color right after I put the black color in. I think I should have waited for the black ink to dry thoroughly. 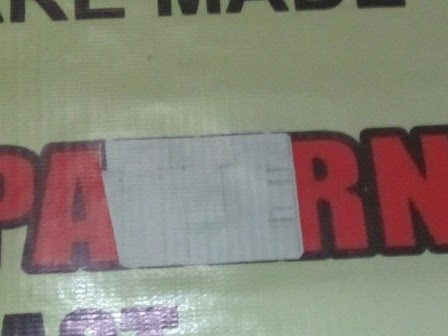 When the marker tip of the red-colored pen hit the black ink, the black color somehow smudged and joined with the red color, and now parts of it appear a bit darker. But still, I'm happy with the results. It looks much better than before. We no longer have to apologize to our guests, nor cringe when reading the text on the tarp every time we meet.